Council took more than five hours to make decision on entertainment licence. 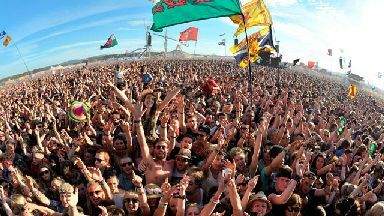 T in the Park will go ahead at Strathallan Estate for a second year despite protests. Perth and Kinross Council took more than five hours to approve the festival as objectors expressed concerns about the site, including traffic flow and crowding. Mark Liddiard, one of the main objectors, took in bottles of urine and rubbish he said was dumped in his garden. Festival director Geoff Ellis and newly hired executive producer Melvin Benn told the meeting about the changes they have made to avoid some of the problems. The alterations include extra car parks, separate roads for buses and cars, as well as a larger site. Organisers have also agreed to cap ticket sales at 70,000 a reduction on 85,000 who have been at previous events. After the debate, councillors voted unanimously to grant the festival a one-year entertainment licence, despite the organisers' desire to gain a licence for three years. Melvin Benn, T in the Park's new executive producer, said he was "comfortable" with the one-year licence. He said: "We're delighted to have received our licence for 2016 and we'll be happy to be judged on this year's event. "We've robustly addressed the shortcomings from 2015, we have a brand new team in place with a huge amount of expertise and the council has recognised the sheer volume of work that has gone into this year's planning. "T in the Park is Scotland's national festival and fans will be able to book their tickets safe in the knowledge that their biggest issue this year will be choosing who they want to see." "The changes we've made to the management structure, arena, security, campsite and travel will make for a positive festival experience. "The new arena layout gives more room, better stage positions and makes the most of the stunning site. "The campsite will have lots of great entertainment and plenty of staff on hand to help. "Security teams have been restructured and the on-site transport provisions improved. "I cannot promise the weather, but I can promise everything else will be OK and T 2016 will be remembered for all the right reasons." Big names including the Stone Roses and the Red Hot Chilli Peppers have already been confirmed to play the three-day event. Geoff Ellis, festival director and chief executive of DF Concerts and Events, said he wants this year's event to be remembered for the "incredible line-up, the best entertainment and fun with your mates." He said: "I'd like to thank all of our partner agencies, particularly Perth and Kinross Council, Police Scotland, and Transport Scotland, for their input into the planning to date. "I'd encourage fans to read the information and take a look at the new maps on the T in the Park website before they set off for this year's festival." "It's going to be Scotland's biggest weekend of music - it's your licence to party." Organisers insist buses are the best way to access the festival and are offering free bus travel to those who book weekend camping tickets over the next ten days.